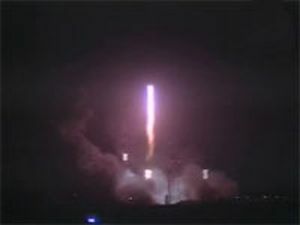 An ILS Proton rocket launched the new W2A communications satellite into orbit from Baikonur Cosmodrome, Kazakhstan on April 3, 2009. AProton rocket blasted off from Kazakhstan Friday, beginning a more thannine-hour mission to deposit a versatile European communications satellite intoa high-altitude geosynchronous transfer orbit. The 191-foot-tall rocketleft the Baikonur Cosmodrome at 1624 GMT (12:24 p.m. EDT), turning northeastfrom the launch pad and tearing through the night sky on the power of six firststage RD-276 engines. Eutelsat's W2A spacecraftis bolted atop the rocket, beginninga mission to deliver a variety of communications services to Europe,Africa, the Middle East, and parts of South America and India. The Proton droppedthe first stage about two minutes after liftoff, giving way to the booster'ssecond stage for a burn lasting about three-and-a-half minutes. The third stage ignited andjettisoned the second stage five-and-a-half minutes into the mission. TheProton next released the payload fairing, which protected the W2A satelliteduring the first few minutes of the flight. After emptying its fueltanks, the third stage main engine shut down and separated from the Breeze Mupper stage nine-and-a-half minutes after launch. The Breeze M stage, fueledby an explosive mix of hydrazine and nitrogen tetroxide propellants, took overthe launch and ignited for its first burn 11 minutes and 39 seconds afterliftoff. The burn injected the stageand the 13,000-pound W2A spacecraft into a temporary low-altitude parkingorbit, according to International Launch Services, the U.S.-based firm thatmarkets the Proton rocket to commercial customers. The Breeze M will fire fourmore times to gradually raise its altitude and reduce its orbital inclination. Plans call for the rocketto reach an orbit with a high point of 22,118 miles and a low point of 3,113miles. The targeted inclination is 20.7 degrees, according to ILS. Spacecraft separation isscheduled at 0134 GMT Saturday (9:34 p.m. EDT Friday), ending the launch phaseof W2A's anticipated 15-year mission.